In a year or two, once funding and planning is in place, the City plans to follow the recommendation of the LR Kimball (LRK) team and demolish the McBride Viaduct. However, there is still a glimmer of hope if a legal entity is formed to repurpose the bridge. Built in 1937 to get cars, trucks, and people over the railroad tracks, the Viaduct connects East Avenue from East 12th Street to East 19th Street. Neglected for decades (current water drainage is in disrepair), the hulking structure was closed to vehicles in 2010. Though the Viaduct is no longer capable of supporting cars and trucks, it remains a vital artery, and if we are good stewards this year, the gift from our Depression-era forebears may be enjoyed by our grandchildren's grandchildren. With crime, poverty, and taxes all on the rise in Erie, spending money to save the Viaduct may appear to be a misuse of limited available resources. 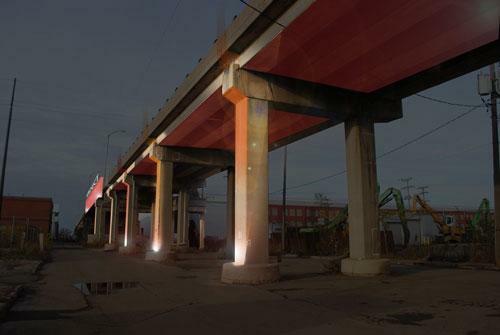 However, the Viaduct is a good investment, because it holds promise for revitalization and will maintain East Avenue's connection to the surrounding areas. The value of this area and the need for revitalization is finally starting to gain traction with the recent acknowledgment by local politicians Bob Merski, Andre Horton, and Pat Harkins. The Bayfront Highway forms a gigantic horseshoe of asphalt around the city. The highway has severed neighborhoods, leaving dead-end streets. In addition, the CSX railroad – with myriad trains passing each day – divides Erie's downtown core. Progressive cities, including other Great Lakes cities like Buffalo and Milwaukee, are removing obstacles to attractive pedestrian and bicycle circulation. While LRK's and the City view the planned path along Buffalo Road and the Bayfront as an adequate replacement for the Viaduct, it is not. The Viaduct provides an on-axis link for East Avenue over the railroad, correcting the otherwise dead-ends at the tracks, and it makes a direct connection to the East Avenue business corridor with a 29-foot-wide path. In contrast, the Bayfront does not connect, or acknowledge, East Avenue. If the Viaduct is demolished, the pedestrian and bike route will be shifted to a 9-foot path next to a busy highway. The city hired LRK, a firm with ten offices in five states but headquartered in Ebensburg, Pa., which provides design and planning support for architecture and civil and environmental engineering projects, to conduct a study of the Viaduct to make recommendations. Last year's study advocated tearing down the Viaduct, additionally proposing that construction of a four-way interchange (and pedestrian pathway) at Buffalo Road and the Bayfront is an adequate replacement. While the LRK plan is a reasonable solution for cars and trucks and helps East-West pedestrian connectivity, it unfortunately suggests a critical anti-pedestrian/bike component. Demolishing the spacious Viaduct, with its compelling views of the city and the tracks, and diverting pedestrians to a 9-foot-wide path alongside the Bayfront Connector is a step backwards by today's urban design standards, which give preference to the comfort of pedestrians and bicyclists over drivers. City planning projects should typically engage urban designers to ensure proper team expertise. Urban designers know how sidewalks, bike paths, public transit, and creative circulation options promote vital, efficient cities. Though the Viaduct is located in a city, the LRK team conducting the Viaduct study included only engineers. Thus, LRK focused more on traffic and not nearly enough on urban design. The study failed not from a lack of good effort, but from employing an incomplete team. The plan does not adequately consider how quality pathways build communities, promote health, and foster economic development. Some who look at the Viaduct see nothing but a liability. They are unaware of how investment in significant public spaces, such as the Portland Harbor Drive and the Milwaukee Park East Freeway, can contribute positively to a community's public image, safety, jobs, and tax-revenue-providing businesses. In addition to providing safe passage over the tracks for pedestrians, a repurposed Viaduct could create better construction jobs. Vital public spaces, like the one proposed for the Viaduct, have been proven to spur private investment, thus creating more jobs and raising the tax base. After stabilization of the bridge, public history and art projects can be commissioned (with the help of the Erie Art Museum, Preservation Erie, and others) to celebrate Erie's manufacturing legacy and immigrant populations. While fostering a positive "sense of place" in a neglected part of the city, a Viaduct art-park will attract industrial and cultural tourists and train-spotters. New urban gardens at the Viaduct (built and maintained with involvement of community, business, and school groups) along with linkage to other paths connecting a series of attractive public spaces (Wintergreen Gorge, East Landing, Dobbins Landing, Liberty Park and Frontier Park), could establish an Eastside destination for pedestrians, runners, and bicyclists. Such an "Emerald Necklace" concept could foster a more cohesive city. It is speculated to cost $3 to 4 million to stabilize the Viaduct; however, the $2.3 million PennDOT has scheduled for demolition can be used for stabilization. Another $1 to 5 million must be raised by a new public-private partnership to enhance and maintain the Viaduct. To save the Viaduct, there must be community support. A legal entity, such as a public-private partnership, must be formed to work with the city and other stakeholders to plan renovations, manage funds, and supervise a long-term maintenance program. Potential partners who have indicated willingness to become involved in this effort including: Bike Erie, Erie's Public Schools, the Erie Art Museum, the Lake Erie Region Conservancy and Preservation Erie. If you believe the Viaduct is worth saving, don't be quiet about it. Let City leadership hear from you. Bring some friends to the one-hour Viaduct Update on Sunday, Jan. 25 at 1 p.m. at Poets' Hall, 1136 East Lake Road. Civitas members can be reached at their website www.civitaserie.com, via Facebook at CivitasErie, by emailing Lisa@civitaserie.com, or by scheduling a Friday morning meeting at the Civitas office in the Masonic Building, 32 W. Eighth St. Adam Trott can be reached by phoning his office (814) 456-8667.